It turns out sweltering heat tends to drive up our movie-watching frequency, but also more or less limits it to what we can pull up on demand at home rather than going outside. Hence, we watched Jack Reacher (imdb | rotten tomatoes) last weekend. I wasn’t looking forward to it, but for two hours it was reasonably entertaining and rarely annoying, which is better than I expected. So there you go. 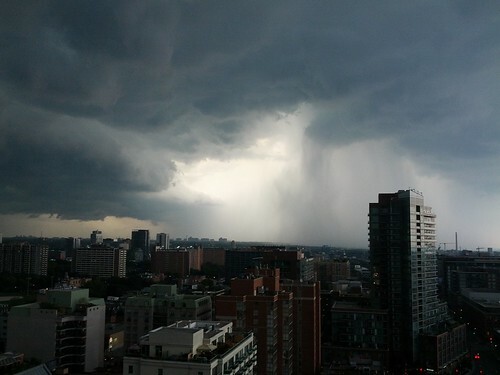 A similar deluge hit us a few minutes later. We ducked and covered down the street to Triple A for some grub, some beers, and a shot of bourbon. Once the rain broke we took the streetcar to Bar Hop for another pint — Ommegang BPA for Nellie, Indie Alehouse Broken Hispter for me. 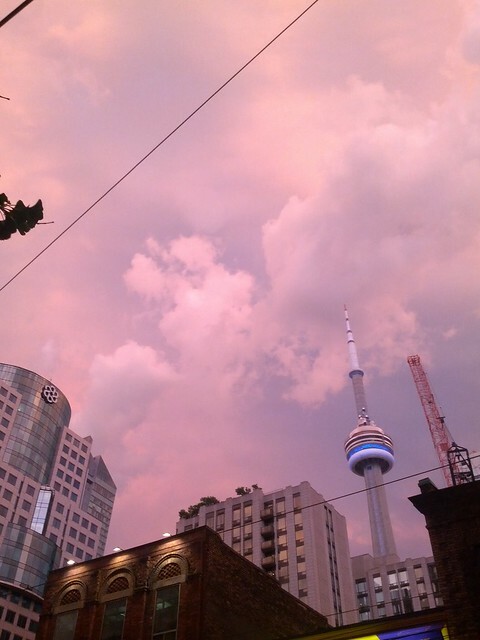 We left to find nearly everyone on King Street staring up at the weird cloud patterns and colourful sky left behind by the storm. The evening’s plans weren’t centered around the storm, actually, but around a screening of Only God Forgives (imdb | rotten tomatoes), Nicolas Winding Refn’s followup to Drive. Anyone who had only seen that film and not the rest of Refn’s work probably left the Lightbox theatre somewhat confused. It was slow and quiet and textured and incredibly violent and overall pretty weird. Which is to say, like most of Refn’s movies — the ones I’ve seen, at least. Amos Barshad did a fantastic piece at Grantland yesterday about Refn and his latest film (beware: it’s a little spoiler-y) which they refer to as “An inversion of Valhalla Rising’s Scottish Highlands”. I thought that was accurate — like Mads Mikkelsen’s One Eye, Ryan Gosling’s Julian barely speaks in the film, and violence bursts through these long, droning sequences which were gray and earthy in Valhalla Rising, but raging neon here. The film certainly isn’t for anyone, and may not be for anyone expecting another Drive, but good for Refn for making his movie and not chasing what was likely a multitude of offers to make practically the same again. Both Nellie and I have been doing work on this Saturday, but watched another dumb action movie before we got started: The Bourne Legacy (imdb | rotten tomatoes). Which was exactly what you think it’s going to be. So, fine, but boring.